Place zucchini, asparagus and bell pepper on a baking sheet or dish and drizzle with olive oil and salt, tossing lightly to coat. Place vegetables in oven and roast for 30-45 minutes or until tender. While vegetables were roasting, prepare pie crust. Cut in shortening using two knives or a pastry cutter until the mixture is grainy and resembles a fine meal. Add cold water until dough can be shaped into a ball -- err on the side of wet rather than dry and crumbly! Form dough into a ball, wrap in plastic and set aside on the counter for 30 minutes. Reduce oven to 375 F.
Place pie crust in pie plate or individual baking dishes, pinching edges to form a decorative border. Place roasted vegetables in first (including parboiled potatoes, if desired), adding red onions, Roma tomato slices and spinach on top. Drizzle with remaining olive oil and a pinch of salt. Bake for 35-45 minutes or until crust is golden brown, and spinach and tomatoes are wilted. Cut the the top 1/2" off of a head of garlic. Wrap the whole head in foil with a light drizzle (1 TSP) of olive oil. Roast at 400 F for 30-35 minutes, or until soft. I love these & will be making various versions I think! I've included the recipe for Jules Pie Crust because it is our down-and-dirty favorite, easily vegan/dairy-free and still flaky! 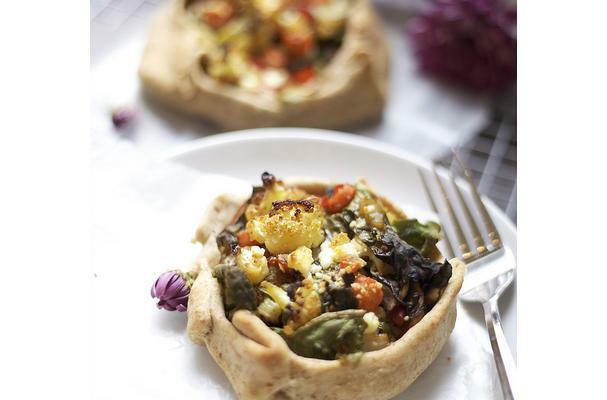 This tart is super easy and forms the perfect base for tons of variation: add squash, swiss chard or collard greens, roasted broccoli or cauliflower, etc - even add tomato sauce for a heartier tart!